There's been a lot left undetermined regarding the life, death and ultimate fate of Steve Rogers, the first man to don the chain mail and wing-tipped mask of Captain America. What's clear is that he was gunned down in cold blood on the steps of a DC courthouse, mourned by an entire nation and quietly sent to his final resting place below the arctic ocean by a small group of friends. But even today, two years since his assassination, many of Cap's closest friends smell a cover-up. And when Sharon Carter suddenly starts to recall the details of her brainwashed fatal strike on that rainy autumn day, the floodgates burst wide open. Is Rogers truly dead? More peculiar, could he truly be alive? The answer to both questions might just be no. Naturally, the only man most fans would trust with attempting to revive such a revered icon would be Ed Brubaker, the very same writer who penned Steve's final moments twenty-five months ago. 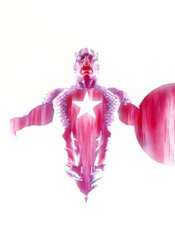 Under Bru's watch, Captain America has become a commercial and critical success, reinventing the character (not to mention the men who play him) and his closest companions while slowly altering the book's personality. His complex, interwoven plots, slow pace and frequently political overtones have given the series a mature slant that seems much more at home with America's present identity both at home and abroad. Make no mistake, much of that carries over to what Brubaker has produced in this first episode of Reborn. We're dealing with the same cast, naturally expanded to include many of the big players elsewhere in the Marvel Universe, they're working within the same dark, seedy world, and much of the plot is dependent upon a lot of quiet, effective espionage work. Familiarity isn't the problem, it's the dramatic turn into the realm of bad science fiction the issue takes around the halfway point that's stuck in my craw. The hinging point of Steve's death and ultimate resurrection, the device at its core, comes so completely out of left field that it requires more of a suspension of disbelief than I'm willing to provide. There was a certain degree of sad irony to the way Steve died, amidst the panic of a sniper's bullet on those cold courthouse steps. Here was a man that had personally stared down the onslaught of a Nazi war machine and emerged unscathed, but he still wasn't safe on the front lawn of his home country's justice system. Can the big payoff to that stirring scene really be something so far-fetched? Taking time away from his run with Fantastic Four, resident Marvel superstar Bryan Hitch provides Cap Reborn with its artwork. Sadly, even his efforts are disappointing, especially when compared to the recent success he's had alongside Mark Millar with F4 and the seminal first two installments of The Ultimates. Hitch still delivers a small spattering of unmistakable panels and spreads this month, but spends the rest of the volume seemingly obsessed with matching the tone and style of Alex Maleev, Sean Phillips and, more likely, Cap mainstay Steve Epting. The attempt is admirable, but only seems to weigh down Hitch's normally striking attention to detail and dazzling compositions. With the exception of a few occasional splashes of color, the thick strokes and drab, murky atmosphere that coat this issue's visuals are hard to get through, often rendering the work of one of my favorite artists nearly unrecognizable. I can't help but wonder if the typically slow-but-reliable Hitch has bitten off more than he can chew by taking on this project. Look, at the end of the day this is a comic book. Strange things happen routinely and are accepted as fact. I get that. It's just a tremendous disappointment to see something so smart, so different, distilled into yet another empty, confusing, cheesy major event, almost at the drop of a hat. If you've been enjoying Brubaker's run with Captain America so far, you'll find plenty to enjoy but will more than likely be just as sourly disappointed in the way they explain away Steve's triumphant return as I was. Flip through it and see for yourself.